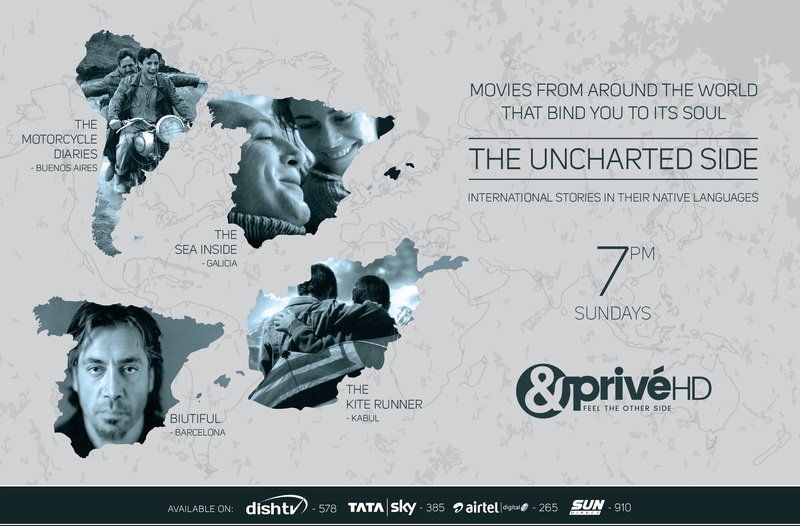 &Privé HD presents The Uncharted Side - international stories that unveil the world and reveal a new you! Cinema is considered as the biggest bridge that connects people across the world. Great stories evoke emotions that bind everyone together transcending all boundaries of languages and regions. Bringing compelling stories from across the world, &Privé HD, the premium destination for nuanced cinema, presents its newest property, 'The Uncharted Side' – international stories in their native languages. Starting 8th July, The Uncharted Side will air every Sunday at 7 pm all through this month. The Uncharted Side will showcase four movies from around the word that will bind you to its soul. These movies will take the audiences on an enchanting voyage discovering new lands whilst enabling them to feel the journey reveal within them. Movies in this property include – Kite Runner (8th July), Biutiful (15th July), The Motorcycle Diaries (22nd July) and The Sea Inside (29th July). The Kite Runner tells the story of Amir, who returns to his homeland in Afghanistan, after spending years in California, to help his old friend Hassan, whose son is in trouble. Based on the book of the same name by renowned author Khaled Hosseini, the film was nominated for the Golden Globe Award for Best Foreign Language Film in 2007. Biutiful is a 2010 Spanish drama about a man, Uxbul, living in this world, but able to see his death, which guides his every move. It is directed, produced and co-written by Alejandro González Iñárritu and stars Javier Bardem. The film was nominated for two Academy Awards in 2011: Best Foreign Language and Best Actor for Javier Bardem; his nomination was the first entirely Spanish-language performance to be nominated for the award. Bardem also received the Best Actor Award at Cannes for his work in the film. The Motorcycle Diaries is a 2004 movie about the journey and written memoir of the 23-year-old Ernesto Guevara. The film recounts the 1952 expedition, initially by motorcycle, across South America by Guevara and his friend Alberto Granado. Directed by Walter Salles, the film stars Gael García Bernal, Rodrigo De la Serna, Mía Maestro in key roles. The Sea Inside a 2004 Spanish drama written, produced, directed and scored by Alejandro Amenábar and stars Javier Bardem and Belén Rueda in pivotal roles. It is based on the real-life story of Ramón Sampedro who was left quadriplegic after a diving accident, and his 28-year campaign in support of euthanasia and the right to end his life. The movie won the Academy Award for Best Foreign Language Film in 2004.